London may not be known as the city of love, but maybe it should be. Beautiful architecture, stunning views, wonderful winter gardens and romance on the river - it's enough to even make the French go oh la la! Take a picnic and admire the views over the city. Considered by many as one of the most romantic green spots in London, this small, grassy, hilly park, boasting fantastic views over London, has become increasingly popular with the young, the trendy and the famous - particularly from the media world, but don't let this put you off. It's a great place to stroll through and take in the scenery. Having climbed the steep slopes and admired the panorama you can regain your strength in one of the many cosy cafes, restaurants or pubs nearby. One of the most pleasant ways to approach the park is to get off at Camden Town and walk along the canal. If it's bright and breezy take a kite, some mittens and a hat, a thermos of vin chaud and two glasses and admire the sunset over the city. An idyllic romantic destination with pretty waterways, canal boats, restaurants, bars and cafes. If you can't afford the real thing this Valentine's Day, don't fret. You may not be able to glide along on a gondola whilst being serenaded by a swarthy, pole-wielding Italian (no bad thing you might think), but London's Little Venice is appropriately interspersed with pretty waterways, canal boats, restaurants, bars and cafes, lending the whole area a cosmopolitan, laid-back, continental vibe. When Robert Browning coined the term Little Venice he was describing the point where the Paddington Arm of the Grand Union Canal meets the Regent's Canal, however it now refers to the whole area to the south of Maida Vale. The small island at this junction is now called Browning's Island, and it was in this area that Robert and fellow poet Elizabeth Barrett conducted a secret love affair that ended in marriage and produced some wonderful love sonnets. In their honour, have a wander around this dinky enclave and then pop into the Canal Cafe Theatre at the Bridge House pub. Enjoy a glass of wine before heading up into the theatre for their regular NewsRevue comedy slot - every Thursday to Saturday at 9.30pm and Sundays 9pm. Sitting around a candlelit table in the company of some truly talented comedians can't be a bad way to end your Valentine's Day. Alternatively, for a scenic water-side walk, follow the canal route north-east for 2.5 miles and you'll end up in Camden where you can browse the markets, or stroll across to Regent's Park and London Zoo. If you can get in, Sky Garden boasts one of the most romantic views London has to offer. The free-to-access Sky Garden, occupying the top three floors of Rafael Vinoly's 37 storey, 525ft 20 Fenchurch Street (aka the Walkie Talkie), boasts one of the most spectacular, and romantic, views in London. Despite the option of booking the free to access space, the queues can be a pain - we've given up on at least one occasion when it was around the block - so to guaranteed entry we recommend booking one of the several dining spaces. Upon arrival, guests to the Sky Garden will arrive by an express lift at a beautiful landscaped garden at level 35 designed by award-winning landscape architects Gillespies. A bar serving champagne and canapés, the chic Darwin Brasserie and viewing area can be found at level 36, and a public terrace, Fenchurch Seafood Bar and Grill restaurant and cafe at level 37. Visitors have the option to visit the Sky Garden without dining but booking must be made online at least three days in advance. Be sure to read the terms and conditions too - security restrictions include only liquids of less than 100ml and no bags larger than 8 x 17 x 19 inches. Enjoy striking views across St Paul's from the rooftop public viewing platform. Get the lift straight to the rooftop of the One New Change shopping centre to enjoy striking views across St Paul's. Part of the Jean Nouvel-designed building, the rooftop has a huge free public viewing platform with numerous benches that are ideal to take a moment with your loved one. With St Paul's at its most romantic at night, you can combine the experience with a visit to Madison bar and restaurant, which is also located on the rooftop and has heated outdoor seats. The restaurant serves modern and classic European cuisine alongside high-end comfort food. Based largely on 'full-on flavour' meat dishes but also entertaining seafood, pasta and sandwich meals, it helpfully caters for all-day brasserie dining in highly stylish surroundings. The perfect day trip for couples wishing to escape the stresses of central London. Located on the outskirts of the city, Greenwich is the perfect day trip for couples wishing to escape the stresses of central London. The boat trip past the intricate wharfs of East London (hop on a Thames Clipper at Westminster Pier, Embankment or Tate Modern) means just getting there is a treat in itself. On arrival, stroll past the impressive Royal Naval College and the site of the now-burnt out Cutty Sark and make your way to Greenwich Market just off Greenwich High Street. Here, under an imposing glass roof, you can browse the many stalls selling antiquities, clothes, trinkets and delicious food. Weather permitting you can then stroll on to the beautiful Greenwich Park, climb its gradual slopes to the Old Royal Observatory and preside over one of the most impressive views in London as Greenwich, the Thames and Canary Wharf and the City stretch out before you into the distance. If you fancy a spot of light refreshment pop into the delightful Greenwich Union pub on Royal Hill, described by The Telegraph as "a real treasure... [where] old-style pub values are successfully married to a distinctly contemporary attitude to food and drink". This slick river service transports art lovers from one of the city's best galleries to another. This slick river service transports art lovers from one of the city's best galleries to another. Connecting Tate Britain with Tate Modern, the catamaran boat also stops at the London Eye. A cool way to travel, you can take in some world class art while also indulging in a spot of riverside sightseeing. The vessel, which seats 220 passengers, travels between the Millbank Pier outside Tate Britain and Bankside Pier by Tate Modern. Opened in Spring 2002, Millbank Pier is one of the more beautiful piers on the Thames. The steel-clad structure was designed by architects David Marks and Julia Barfield, designers of the London Eye, and Angela Bulloch, an artist shortlisted for the Turner Prize in 1997, created an integrated light installation, 'Flash and Tidal', which illuminates the pier. The clue is in the name - this is one of the best views in London. The artery to some of London's best cultural spots, great restaurants and cafes. One of London's most popular destinations for weekend walkers, the South Bank remains so appealing because of its central setting, its proximity to the Thames and its impressive roll call of activities and places to visit. For a full appreciation, you should approach from St Paul's Cathedral across the Millennium Bridge, or from London Bridge after an excursion to Borough Market. Amble down to the Tate Modern for a spot of culture (the permanent exhibitions are free, while the cafe offers excellent views back across the Thames towards the City) and then continue alongside the river towards Waterloo. On your way you will pass the famous Oxo Tower (why not head up to the top for a drink in the bar? The views are breathtaking) and the rather cute Gabriel's Wharf. When the tide is out, sand sculptors entertain the crowds by making impressive figures and objects in the one bank of the Thames that resembles a beach more than a muddy rockery. Continue up towards Waterloo Bridge, underneath which the famous book market is held. 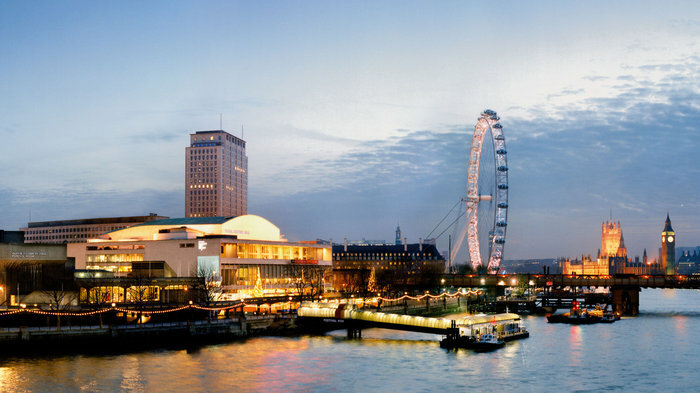 Have a drink or catch a film at the BFI or see a concert at the Southbank Centre. Further down the bank will take you to the London Eye and then Westminster, but if you cross Embankment Bridge you'll find yourself soon in the thick of the West End ready for your evening show or a glass of red wine in the cavernous Gordon's Wine Bar on Villiers Street. The name says it all for this beautifully restored country house and gardens. Built in the late 17th century and set in acres of wonderful countryside in the heart of Ilford, the aptly named Valentines Mansion and Gardens are a great day trip for Londoners. The beautiful brick country house was restored recently with Redbridge council and Heritage Lottery funds and this historic yet contemporary venue boasts a splendid Victorian kitchen and Georgian rooms, with gorgeous views over surrounding parkland. The stunning grounds include an old English walled garden, a Victorian rose garden, a canal, some rococo grottos and a dovecote. The gardens host a range of events, from open-air theatre to Sunday farmers' markets, while the interior of Valentines Mansion often exhibits contemporary art collections and installations. It also played host to the recent BBC2 'Great Comic Relief Bake Off'. A higgledy-piggledy treasure trove of artefacts. An appealingly higgledy-piggledy treasure trove of artefacts, this extraordinary house elegantly located on Lincoln's Inn Fields is well worth an exploratory rummage à deux. Lurking in nooks and crannies within the sprawling rooms and halls of neo-classical architect Sir John Soane's former residence are over 30,000 architectural drawings and antiquities. Works by Turner, Canaletto and Piranesi feature in the painting collection, with William Hogarth's eight canvasses of 'The Rake's Progress' forming the centre-piece. One look at this symbol of masculine waywardness and depravity will remind most ladies what a decent catch they have on their arm. Museum tours take place every Saturday at 11am and there are so many nooks and crannies, you'll be able to elope for the odd covert passionate embrace amidst the Romantic art adorning the walls... The first Tuesday night of the month candlelit visits are truly romantic and attract large queues. Get your Valentine's weekend off to a sumptious start with a trip to Borough Market. The market has been attracting crowds of food fans every Thursday, Friday and Saturday for years now, so tantalise the tastebuds and get your romantic juices flowing with a trip to one of the capital's most atmospheric locations. This gourmand's delight is London's oldest of its type and boasts a resplendent range of fresh food stalls under its Dickensian wrought-iron roof. Italian cheeses, Morecambe Bay shrimps, Spanish delights and much more make their home here. You're encouraged to "try before you buy" so you and your partner can get hands-on indulging in a series of tasters before taking the plunge and picking up a range of 'high in quality, high in flavour' food-stuffs for a romantic meal back home. While you're there, why not visit the Wright Bros stall for a few of those fabled aphrodisiacs, the oyster? Atmospheric, lively and mouth-watering this foodie's paradise is a definite must for any cuisine-loving, canoodling couple. If you've got time, end your outing by walking back along the river towards Waterloo and the South Bank, passing Southwark Cathedral, the Golden Hinde, the Tate Modern and the Globe Theatre. Cuddle up as you walk through the dark, cobbled streets which wind behind the wharfs then have a good old smooch under the fairy lights that illuminate the trees all the way along the river. The cafe looks like a garden shed, but has been awarded a Michelin star. Weather pending, this has all the makings for an ideal Valentine's treat and a memorable day out. To get to these delightful, rustic meadows and gardens at the foot of Richmond Park you can take the train to Richmond and then walk up the river bank. Or - and this is our favourite - you can hop on the river boat at Westminster Pier and weave your way up the Thames, along the route of the Varsity Boat Race, past Barnes, Kew and Chiswick, through a lock, and eventually on to Petersham. Once you're there you'll be transported as far away from the hustle-bustle of central London to Petersham village, a designated conservation area. The nurseries are well worth a stroll, but their real selling point is the wonderful restaurant and cafe complex in the centre, which was awarded a Michelin star in 2012. Located in what can only be described as a glasshouse shed, this is without a doubt one of London's best and most original places to eat lunch, serving exceptionally seasoned, local, fresh produce in a divine location. The likelihood, unfortunately, is that it is already booked out - but do try your luck on 020 8605 3627. If you're unlucky, settle for a warm cup of tea (including some exotic flower varieties) and a nice slice of cake at the neighbouring Teahouse. A Grade II* listed bridge over the River Thames which connects Chelsea to Battersea. 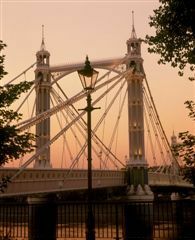 Albert Bridge is a Grade II* listed road bridge over the River Thames which connects Chelsea on the north bank to Battersea on the south. Albert Bridge is the only bridge in central London never to have been replaced. That's not to say that the original 1873 design - by Rowland Mason Ordish - has remained the same. Between 1884 and 1887, Sir Joseph Bazalgette incorporated some of the design elements of a suspension bridge, and the two concrete piers were added in 1973 transforming the central span into a simple beam bridge. At night the bridge is beautifully lit up by 4,000 bulbs, making it one of West London's most striking landmarks. From cheap budget places to stay to luxury 5 star hotels see our special offers for hotels, including Thistle Trafalgar Square, The Royal Trafalgar from 66% off.